City Council Speaker Christine Quinn got three key newspaper endorsements – The New York Times, the Daily News and the New York Post – but her mayoral bid found little support in New York’s ethnic and community media. Frontrunner Bill de Blasio didn’t fare any better. 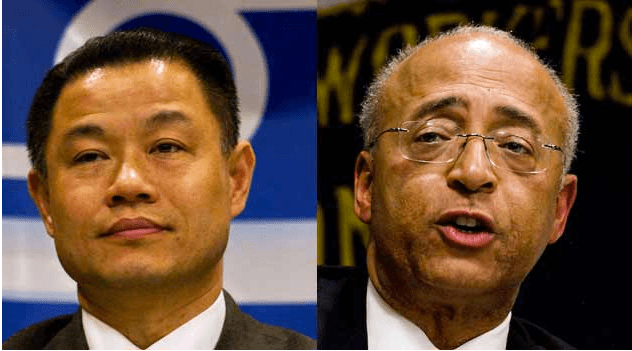 A Voices of NY survey of 30 key community and ethnic papers on the eve of Tuesday’s primary elections found that City Comptroller John Liu and former Comptroller Bill Thompson won the endorsements race in this diverse and influential media. The Taiwan-born Liu, who has campaigned tirelessly in ethnic enclaves, scored six endorsements, five of them from South Asian publications like Urdu Times and Pakistan Post and one from Our Time Press, a Brooklyn-based weekly geared towards African-Americans. Thompson, who is the only African-American on the race, was endorsed by five publications serving a variety of communities. De Blasio scored two including the Haitian Times and so did Quinn, who is vying to become the first woman and first openly lesbian mayor, among them the weekly The Villager. The remainder 15 publications said they wanted to stay neutral for a variety of reason. The outlets Voices of NY surveyed represent more than 270 ethnic and community publications serving Latinos, Chinese, Polish, Korean, Caribbean, Irish, Indian, Haitians, Pakistani, Bangladeshi, Jewish, black, gay and lesbian, and Middle Eastern communities. Interestingly, a candidate’s ethnic background or affinity to a particular community did not always rank very high in the endorsement consideration. For example, the Irish Echo did not endorse, not even Quinn, who is of Irish ancestry. Peter McDermott, the executive editor of the 85-year-old weekly said the paper might endorse if there’s a runoff on October 1. Similarly, none of the four major Chinese dailies officially endorsed Liu, who would make history by becoming the first Asian-American mayor. And none of the leading Jewish newspaper like the The Jewish Daily Forward or Jewish Week endorsed Anthony Weiner, who is Jewish. Thompson’s case was different as he got the endorsement of the New York Amsterdam News, The New York Carib News and the Caribbean American Weekly, all serving the city’s black community. Similarly, Quinn bagged the endorsement of Gay City News. He calls for abolishing stop and frisk. We worry this would lead to a deterioration of public safety and make more Chinese become victim of crimes. He thinks minimum wage should be raised from the current $7.25 to $11.50. We worry this would bankrupt small businesses or force them to layoff employees and hurt the economy. He advocates for less tests in public schools and more African American and Hispanic students in the specialized high schools so the student body could be more diverse. We worry this may have some hard working Chinese students lose the opportunity they deserve to get into the top schools. He is very close to the unions. We worry he would sacrifice the interest of the general public for the interest of the unions. In this year’s Democratic primary, voter turnout is crucial. In the Latino community, it is imperative. As we continue the battle for immigration reform, we are more aware of the millions of Latinos who cannot vote. Yet an embarrassingly low percentage of those who have that right are expected to turn out in local elections. Bill Thompson is the most thoughtful of the candidates. In a race that has been anything but boring, he has been a constant source of common sense and seriousness. With solid experience in both elected and appointed city offices, he brings a deep understanding of long-standing challenges and offers a host of proposals to address them. In its endorsement, the Bengali language weekly Thikana made it clear that it will side with only those candidates who are sensitive to the concerns of the Bangladeshi community. Liu deserves our support for his relentless and outstanding services to the rights of immigrant communities, for his support of two public school holidays for the Muslim Eid festivals and of offering halal food to public school students. And also to ensure the welfare of marginalized communities and small businesses, and to end racial profiling by the police. In a lengthy endorsement, Gay City News revisits the achievements of Quinn in comparison to the other main candidates. It makes it clear that Quinn’s sexual orientation has less to do with its decision. Many, no doubt, will characterize our endorsement as a straight-up matter of identity politics. Baloney. But it doesn’t hide the pride that the paper takes in endorsing a candidate who, if elected, would be the first LGBT mayor. That’s not to say we don’t feel a good measure of pride in endorsing a candidate who would become New York’s first woman and first openly LGBT mayor. It was Harvey Milk who led the fight 35 years ago to beat back a draconian proposal to fire all gay schoolteachers in California. It’s no accident that marriage equality won its first victory in the New York State Legislature under out gay Assemblyman Daniel O’Donnell’s leadership. And, in Texas, it is a woman, Democratic State Senator Wendy Davis, who has indelibly articulated what is at risk from that state’s assault on the right to choose and to healthcare access. We gave great expectations that Quinn can bring unique and disciplined skills to the job of mayor, and we also hope all New Yorkers are prepared to hold her to that promise. In its endorsement of Thompson, New York Carib News calls him an “agent of change,” who has an exceptional record of public service. The editorial also praised Liu and de Blasio. But the candidate who is head and heels above his opponents is Thompson, the grandson of Caribbean immigrants from the tiny islands of St. Kitts-Nevis. Some of his detractors want us to believe that his close relationship with the UFT is a reason to be worried about him. Yet those same critics wanted their favorites to get the union endorsement in the mayoral race. His ideas to reform the schools are sensible, his campaign promise to hold the NYPD responsible to the public when abusive police officers infringe people’s rights and his championing the needs of residents of public housing who have felt the burden of NYCHA’s ineptitude in the management of public housing as well as his support for the rights of workers to receive a fair and living wage make him our choice for the Democratic nomination. This year, Bill de Blasio has published more than 10 columns in Queens Latino on topics as varied as immigration, education, housing, and employment. We have interviewed him on various occasions and we are delighted that he is leading in the race among the Democratic candidates for mayor of New York. It is possible that he will win the Democratic primary without needing a runoff. That is to say, with more than 40 percent of the vote. Bill de Blasio is winning because his platform is different from Quinn’s, which is a continuation of Mayor Bloomberg. It is a terrible time for immigrants in a city of immigrants. Bill de Blasio also has experience in politics and is currently the public advocate of New York City. Since he started his campaign he understood that New York needs a radical change to protect workers, hospitals, small businesses, and public school students. Bill de Blasio wants to raise taxes for the richest residents to pay for children’s education. The city’s community and ethnic media covers roughly 40 percent of New York City’s population. According to New York Press Association’s figures cited by CUNY’s Center for Community and Ethnic Media in its recent report on City’s advertising practices, the combined circulation of 95 ethnic newspapers in New York City is 2.94 million or 28% of the city’s population, and the combined circulation of 80 weekly community newspapers is 1.6 million.